Located towards the head of Loch Craignish at the Northern end of the Sound of Jura Ardfern Yacht Centre sits within an idyllic natural harbour. Whether on a pontoon berth or swinging mooring you will find the area sheltered from the worst of the weather no matter what the wind direction. We have fully-serviced pontoon berths with water, electricity, lighting and free Wi-Fi access for vessels up to 70’ and a maximum draught of 3.5m. Ardfern Yacht Centre has around 80 pontoon berths with visitors pontoon berthing being provided on both sides of the pontoon systems outer walkways. 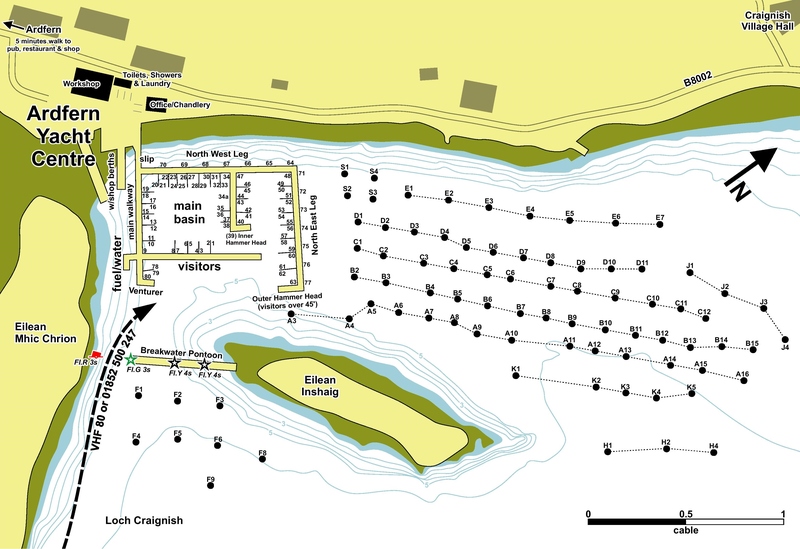 The swinging moorings are well organised to the east of the marina, tucked into the the shores of the top of Loch Craignish. Swinging moorings offer distinct advantages over pontoon berths for timber vessel in particular however, also for those steel, alloy and GRP vessels with expensively painted topsides. Swinging moorings allow a vessel to always lie head to weather. Avoiding the topsides being hard pressed onto the fenders; abrading through the paint coatings in the process. Lying head to weather also allows the vessels ventilation system to operate correctly, drying the boat internally and preventing mildew growth. With our bring alongside service the swinging mooring provides all owners with the benefits of a pontoon berth while enjoy a cheaper mooring rate when not aboard; mooring holders are entitled to use pontoons for loading and unloading of gear and occasional overnight berthing although not on consecutive nights.